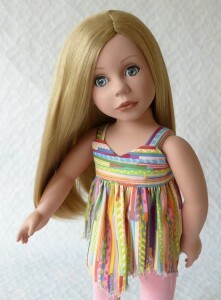 I love to see childhood dolls being gifted down the generations but quite often they are in desperate need of a new wardrobe. 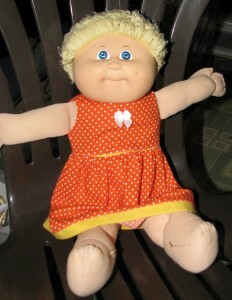 Lee-Ann has been busy sewing for her original Cabbage Patch Kids dolls that she has just handed down to her twin girls. I’m sure these dolls will enjoy playing with their new mummies and the big Mummy will enjoy watching her babies being looked after by her new babies. 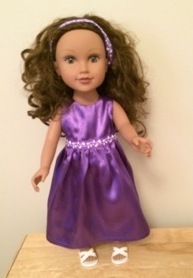 Hi Rosie, I bought your Dresses Pattern Bundle for Cabbage Patch Kids recently to make clothes for my two original Cabbage Patch Kids which I gifted to my twin girls who just turned 4 this past week. I found that your video tutorial was most helpful in explaining the shoulder and side seam sewing. 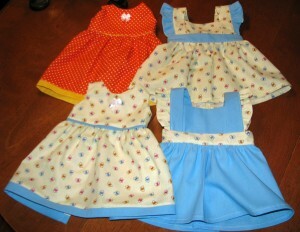 I`ve attached a photo of four dresses I made (in two weeks working AFTER bedtimes…) from your summer dress pattern and pinafore. I also made a fancy long 50s dress in blue satin but haven`t taken a photo yet. Thanks for providing such a great resource that`s easy to sew!! 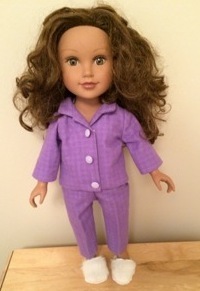 Now although Verna didn’t include a photo, I thought it was wonderful how she is using tips that I use for doll clothes and applying them to her everyday sewing. 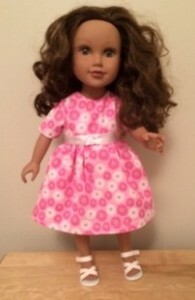 We’ve had such a wonderful response to our change to Lifetime access on our website and it’s great to see so many of you back sewing doll clothes including Betty Ann. I know three dolls that will just love going to bed now! Marilyn has been very creative by mixing and matching pattern pieces from the Summer Dress and the Winter Pyjamas patterns to create a cute dress with short sleeves and I just love the result. Congratulations Marilyn, I’m sure you had one very happy little granddaughter at Christmas time. 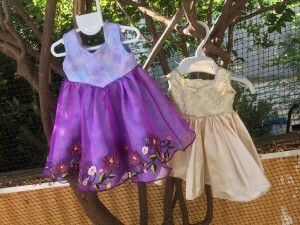 Leane has made some beautiful evening dresses using my Wedding Dress pattern. I absolutely love the detail on the overlay of the purple dress – that’s perfect placement and such clever use of left over fabric! 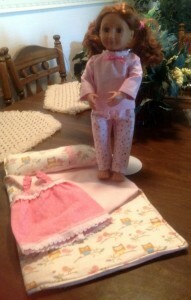 Katy has made this sweet Handkerchief Top for her Bonnie & Pearl doll, Rhiannon. She has been very smart in changing the direction of the stripe for each of the pattern pieces to create this really pretty summer top. ‘I did change the straps slightly and do a buttonhole fastening, as you’ll see. I’m really pleased with the top, it looks great for the beach! Thanks again to everyone for sharing their beautiful creations with us.